“The right/wrong questions on this quiz will be corrected by my own personal correction robot. The written (or typed) questions will be corrected by me. Only then will your final score be known. This is an example of the happy cooperation of artificial intelligence and old-fashioned teacher brain, working in harmony. 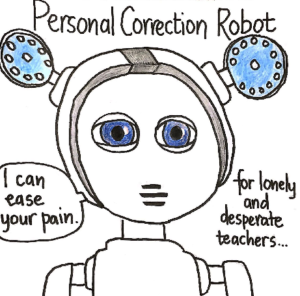 My correction robot works with phenomenal speed, giving you immediate feedback. I plod along like a middle-aged woman (funny, that). Sometimes, my correction robot is a little lacking in intuition. She will mark you wrong, for instance, if you misspell a word. Don’t worry, if I notice that this has happened to you, I shall override her and give you full marks; that is, so long as the word you have misspelt bears some resemblance to the correct answer. So take it easy and don’t stress if you make a small insignificant error. Human intuition is still involved and my aim is to award you as many points as possible. I found this quite funny and thought I’d explain how things work in the background. If you are a pro member, like this user is, than you can have the answers recorded. You can either create a class, share the quiz with Google Classroom or have anonymous answers recorded (you can ask for the name at the beginning of the quiz). You can decide if users get immediate feedback and see the score or not. Separate the alternative correct answers with #. Highlight the whole group of words before clicking the “Create gap word” button. The “correction robot” will now mark both options as correct. NEW: If your students submitted the answers and you noticed that some students entered another spelling and you didn’t add that to the alternative spellings, you can now add it later using the hashtag and when you save the quiz, it will automatically update the score and the answer will now display for all students who used this different spelling as correct. This warning means, that you shouldn’t add additional questions or clozes, but you may still do some changes to the formatting, rephrase a question or add alternative answers as mentioned above. Finally, this teacher mentioned that written questions will be corrected by her. She is referring to the open-ended/essay questions. The answers for these questions can also be annotated inside Learnclick, by going to the details page (clicking on “username”) on the grade page. Learnclick can save time grading. Use these options and ask us if anything remains unclear. So, when the teacher writes that she will override the correction robot if there is a slight misspelling, the way she will do that is by formatting the question to accept the misspelled word as correct? If so, I wish there was another way, e.g. by changing the score manually. Can you? And what if you want to give 2 points to the correct answer (spelled correctly and all) and 1 point to a good effort (e.g. correct but spelled wrong) – is there a way to do that (manually or via correction robot)? Currently there isn’t this option to manually change the score. But it’s already on our feature request list, marked as a high priority feature.